Its been baby posts and pic of the day posts for the last few months...but our home improvements definitely have not been on hold, I've just done a bad job of documenting them. 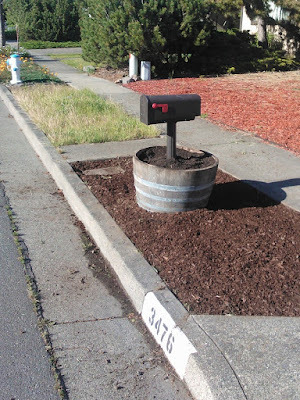 We had a bit of a impromptu mailbox makeover today. We've slowly been working on the front yard by ripping out existing plants and shrubs and replacing our overgrown weed patches with fresh mulch. Eventually we need to have our sprinkler system checked out so we can plant some grass seed or sod (hopefully before the baby comes!). Back to the mailbox...our mailbox was a rotting/leaning mess. 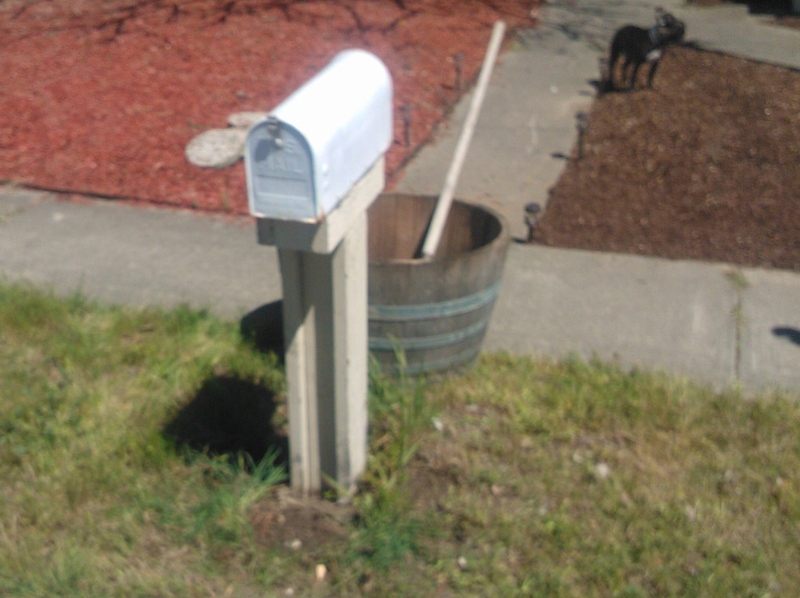 In our neighborhood you have to have your mailbox out at the street...otherwise we would just attach one to our house. 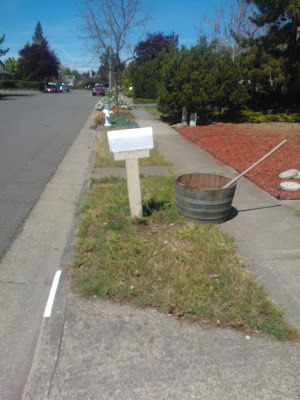 We thought we could revamp our existing mailbox with some spray paint but after we took it down we realized it was probably going to be easier to buy a new one. 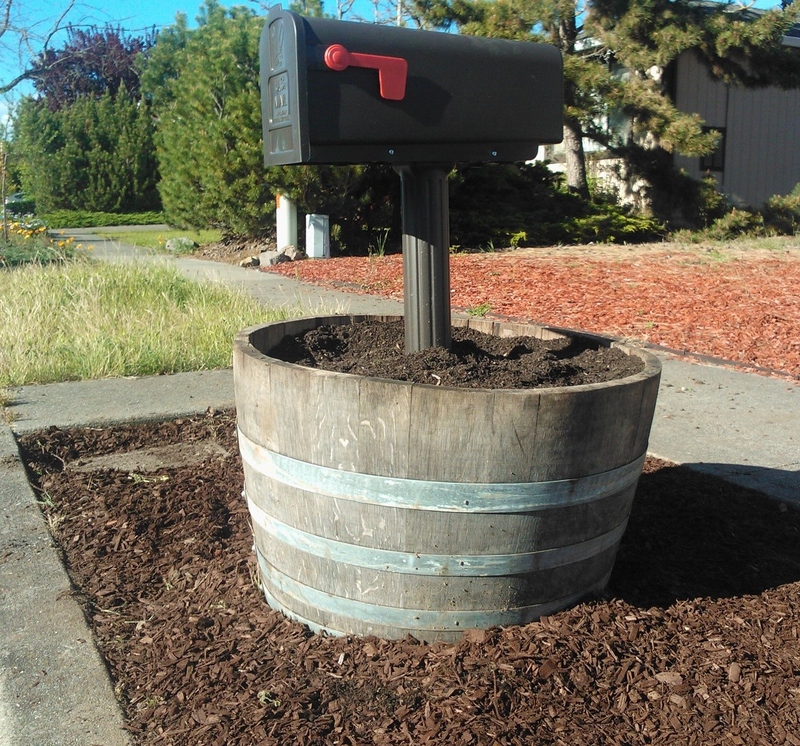 We also knew we wanted to place it in a used half wine barrel. Luckily right down the street from us a man sells them for $18. Steal! We took a trip to Home Depot and found a plastic (no rust) mailbox kit for $29. Rollie dug up the existing weeds, put down some new mulch ($5/bag...I think this space used 2 full bags)...and its now a whole new space. We just need to plant some flowers in the wine barrel...I didn't see anything I loved at Home Depot though. Any suggestions on perennials that can take full sun that might look nice in there?! Nursery dresser/changing table, kitchen counter tops, other front yard projects and more posts to come!